This simple beaded anklet from Beadalon is perfect for a day at the beach. 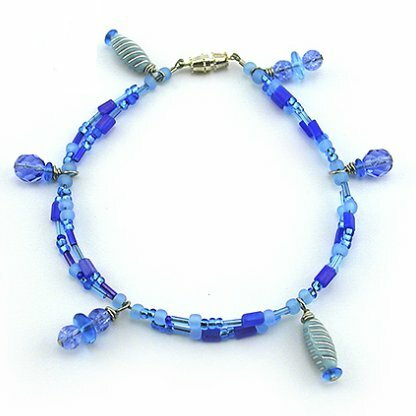 Made with vibrant blue beads, this beaded jewelry pattern will have you ready for summer in no time! You could also wear this anklet as a bracelet if you prefer. If you have additional beads and supplies left over, why not make a matching necklace or a pair of matching earrings? This simple pattern is great for beginners and is a fun way to jazz up your summer accessories. Can't get enough of anklets? Check out How to Make an Anklet: 7 Jewelry Patterns for more projects like this one. To make the dangle charms, string 6-15mm glass beads onto each head pin as shown. Use round nose pliers to make a loop above the top bead on each pin. Wrap the excess wire around the stem. Set the beaded charms aside for Step 3. Hold the two strands of the Beadalon® 49 Strand wire together and place a crimp tube 1/2" from the end. String the both wires through half of the clasp and back into the crimp tube to form a loop. Flatten the crimp tube using the Crimp Tool. Hold the strands together and string an E bead, a beaded charm and an E bead. String 1 1/4" of seed, bugle and E beads randomly onto each strand. Hold the strands together again and string an E bead, a beaded charm and an E bead. Repeat this pattern as shown until all of the beaded charms are strung. Hold the Beadalon® 49 Strand ends together and string a crimp tube 1/2" from the end. String the ends through half of the clasp and place them back into the crimp tube to form a loop. Again, flatten the crimp tube by using the Crimp Tool. Who has made this anklet in another color? We'd love to hear about it! Wow! Beautiful! I made five of these and they are so pretty! wow! So glad you like them!